Time for Day 8 of Obligatory Ice Level Day, and you know what? Team Hyrule Sux. So really everyone should have seen this ice level coming. It’s the Ice Ruins, from The Legend of Zelda: A Link Between Worlds! Link Between Worlds is now considered one of the best Zelda games out there, and it’s not hard to see why. In this direct sequel to the classic Link to the Past, you of course assume the role of Link’s next incarnation. By this point, the events of LttP are a legend in their own right, but a new threat suddenly emerges in the form of Yuga. This powerful mage transformed Zelda and the seven Sages in magical paintings right before mysteriously disappearing into another dimension. As Link explores this creepy new world, he discovers the land is Lorule, a kingdom that exists in a reality opposite of Hyrule’s. Fortunately an odd stranger named Ravio has literally set up shop in Link’s own house in Hyrule. Why’s that so great? Well, Ravio’s a nice enough guy that he allows Link to buy all of his wares and use them in his quest. That’s right, almost all of the items are available right from the start! This means you can explore the dungeons in any order you want. That kind of freedom means you can save the kingdom in whatever fashion you like! 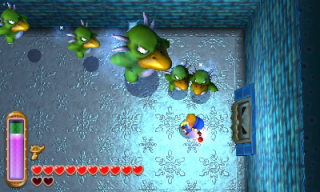 The Ice Ruins is just one of the many dungeons in the game. It’s situated on Lorule’s version of Death Mountain. Man, how great is Lorule that it gets its own ice level? Surely any team based on this glorious land would stand above all others! Now where was I… oh yes, so the dungeon begins in a pretty trollish manner, giving you the key to the boss room right off the bat. But getting to the boss room is another matter altogether. Haha, so sneaky and clever. Classic Lorule! Anyway, the path to the boss is a treacherous one. Ice platforms hover precariously in the air, only to be easily destroyed by your weapons. Narrow, snowflake-decorated ledges wind around the level. Keys are frozen in ice. 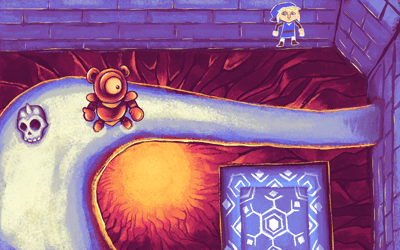 Enemies try to push you into the pits that seem to lead to a fiery, lava-filled demise. Oh yeah, since the Ice Ruins are in Death Mountain, that means there’s lava down below. The ice level’s in a volcano! So creative. So Lorule. Oh yeah, also there’s a room full of Pengators! Y’know, PENGATORS! Half penguin, half alligator! That’s one of the best ideas ever presented in any form of media ever in the history of mankind. How Lorule of them to include such an awesome concept! And speaking of great ideas, the boss to this dungeon is Dharkstare. Much like Kholdstare in LttP, Dharkstare is a giant floating eyeball-monster. It freezes itself in a giant chunk of ice and summons little frozen orbs to attack you. How do you beat this adorable creature? Why, simply get the Fire Rod and melt its frosty armor! This allows you to hit the beast itself with your sword. Isn’t that fun? Of course it is! It’s in Lorule! Lorule is the most fantastic, marvelous, wonderful, fun-filled place of all time! And truly… TRULY… anyone associated with it is not just rad to the max, but the raddest to all the maxes ever. However, Lorule is definitely not a very big kingdom. That is it’s one and only flaw, really. It’s not at all Texas-sized. “IGNORE ME. JUST A PAINTING!” Get the full wallpaper here. Do you like music? Especially super-creepy music that sounds like it was made by the spawn of a demon and one of Santa’s elves? Well good! Because the theme to the Ice Ruins sounds just like that! And here’s the Snowpeak Ruins and Blizzeta battle theme from Twilight Princess. And the theme of frozen Hyrule from Four Swords Adventures, which is a remix of the Dark World theme from Link to the Past… hey, and that’s the song they use for Lorule in Link Between Worlds! Of course! It must be because Team Lorule Rox! Unfortunately there aren’t any remixes of the creepy Ice Ruins music, but there are some remixes of some of the other icy Zelda tunes! This Blizzeta remix is by SonicWave1000, this one is by MeekMudkip, and this one is by Zelda Reorchestrated! The Electric Flute is a remix of Frozen Hyrule, and it’s by halc. Only two more ice levels to go! If you can’t wait until tomorrow’s post, just busy yourself with some arts and crafts. That can usually pass the time pretty well! And hey, you can give the final product as a gift! It’s win-win, really.